Jumping ahead with this post. Primary case components have been created so it is time to see how things fit together. Going through this process made it very clear that I will have multiple opportunities to mess up when using glue. I am marking the pieces as clearly as I can and will continually remind myself to look at those marks. 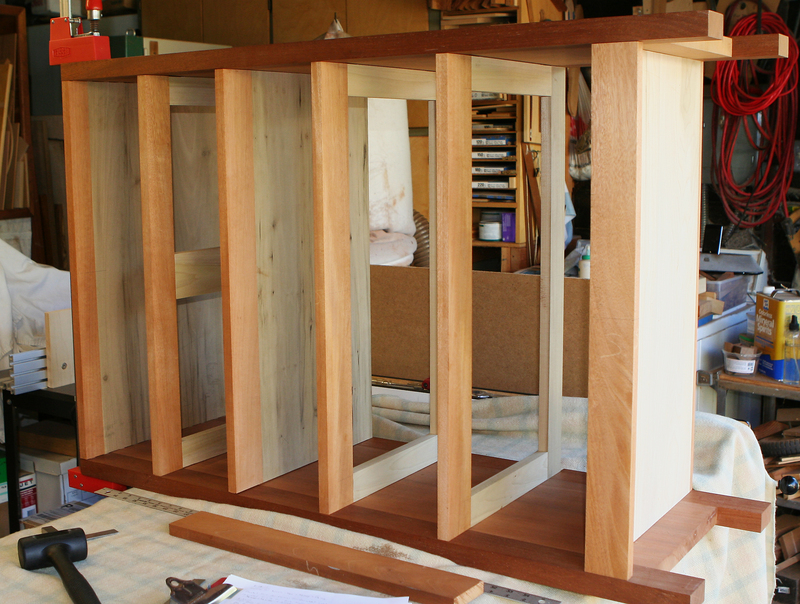 I have not cut the Back Vertical Support (middle) and Vertical Divider (top row of drawers) yet. I wanted to take measurements from the case rather than count on my cut list (as if I had one). 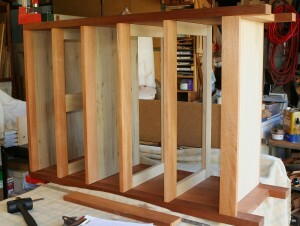 Then I will cut to size and create the joinery. Mortise and tenons for Back Support and short sliding dovetails for the Vertical Divider. I’ve posted some images of the case coming together. I only used clamps for specific places required to take the measurements mentioned above. Once Back Support is in place I will finalize my strategy for the back panels. I feel more confident working from this trial assembly than sketches or plans. I still have not decided on shaping for front apron and bottom of sides. Had thought of a subtle curve running full length. Also have to decide on any leg treatments.